Memorial Day weekend is finally here and summer is right around the corner. With so many folks hitting the road this holiday weekend, Uber is excited to partner with the Governors Highway Safety Association (GHSA) as part of the national Memorial Day ‘Click It or Ticket’ campaign to raise awareness of the importance of wearing your seatbelt while sitting in the back seat. According to the latest data, 87 percent of drivers and front seat passengers wore their seat belts in 2014 — but unfortunately belt use in the back seat was only 73 percent for passengers age eight and older. That same year, more than 800 back seat passengers were killed — unbuckled — in car accidents. Tragically, nearly half of them could have survived if they had only worn their seat belt. That’s why we are doing our part to raise awareness with Uber driver-partners and riders. 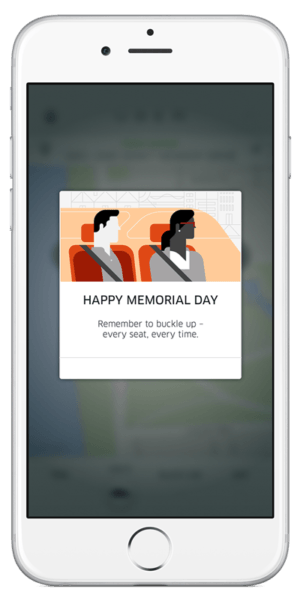 Throughout the Memorial Day weekend, riders will see messages in the app reminding them to wear their seat belt. We wish everyone an enjoyable and safe Memorial Day weekend. And don’t forget to buckle up in the back!